Fasten your seatbelts because I'm going to reveal Doug's biggest, deepest, darkest secret … he has Poland Syndrome. Dave (from Houston) go ahead and hit the delete key unless you've always wondered why Doug's shirts fit funny, why he's been walking with a limp for several years, and why he's faster on one tack than the other. Poland Syndrome (PS) is a rare birth defect with varying degrees of severity and didn't even have a name until 1962 (when Doug was 12). This blog post does a great job of explaining it and showing pictures which are very similar to Doug. Doug has a mild case in that he is only missing his entire left pectoral muscle (sternal and clavicular head), has a smaller and weaker left arm and has mildly limited left arm rotation. Think about that for a second … how many things do you do when sailing that requires the use of your pectoral muscle? 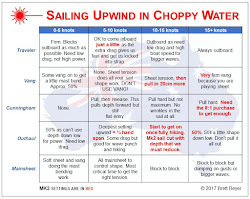 Pulling in the main, pulling on and releasing every sail control, steering, getting on the centerboard to right a capsized boat, launching a dolly, stepping the mast, loading and unloading a boat from a trailer. It's a fairly comprehensive list. Having PS has meant that Doug has a lifetime of experience in accepting that he is physically incapable of doing some things in the same way as others and must therefore think outside the box and look for ways to adapt and overcome. 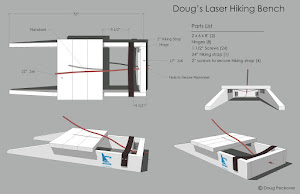 Since Doug is a two time Laser Masters' World Champion and the only US sailor to have ever won both a Master and Grand Master World Championship, I'd say that he's adapted and overcome quite well. Hopefully, that statement will come off as encouraging to those with this condition and not as bragging. I'm writing about this for a few reasons. First, and foremost, I’m seeking input for a specific issue from anyone in the medical field or with personal experience with this condition. Secondly, it's to provide a means of reaching out and connecting with others with this condition who, like Doug, have only recently learned the name of what they have and why they are different. From my research, it appears that most people hide this condition and have never been officially diagnosed. Throughout Doug's lifetime, until several years ago, most doctors have simply looked at his chest and said 'well how about that' completely stumped as to what they were seeing. Doug learned the name of this when I started doing research and then he confirmed it with his doctor when he had his left rotator cuff issue a couple of years ago. Three notable athletes with this syndrome, two of which, have the rarer left pectoral muscle missing as opposed to the more common right, are: 1) French boxing, Olympic silver and bronze medalist, Jérôme Thomas; 2) Spanish Formula 1, two-time World Champion, Fernando Alonso; and 3) American golfer, PGA Tour winner, Bryce Molder. I've seen pictures on the Internet of Jérôme and Fernando without their shirts and it appears they have some muscle tissue (clavicular head) which Doug does not have. 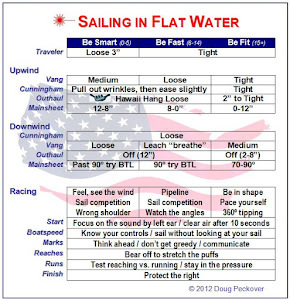 I first learned about this shortly after meeting Doug when he was trying to encourage me in sailing. I'm fairly petite and was convinced that I was not strong enough to sail a Laser (I'd only tried a full rig) so he challenged me to an arm wrestling match with my strongest left arm. With a small effort, I beat him and was convinced he let me win only to learn that he had not. That's just how weak his left arm is. So, for all those sailors over the years who have come to his aid when they noticed him struggling to step a mast in a breeze, lift a boat onto a trailer, drag his dolly out of the water after a windy series, get back on the docks after falling in the water, or right a capsized boat … he genuinely needed and appreciated the helping hand. After Hyères, and watching Doug struggle in those conditions … and after he had lost 30 pounds a few years ago when doing the food combining I had suggested ... and after he has been unable to put any weight back on for years now, I felt compelled to take matters into my own hands. Armed with the knowledge from one college weight lifting class, my trusty book, "Strong Women Stay Young" and my nifty Internet research skills, I've taken on the task of becoming his personal trainer. After all, very few doctors or trainers know anything about PS and its limitations, so why not jump in and see what I can do. This is where I need input (ideas, personal experience, anatomy knowledge, etc.). My goal is to add about 10 to 15 pounds of muscle primarily to Doug's upper body in time for the Worlds in Canada in June 2015 (don't laugh). Because he has always been lopsided, he has avoided doing any upper body exercises except for arm strength because he didn't want to emphasize the lopsidedness. So, my task is to figure out which muscles are there and build the heck out of them and, so far, they're building pretty fast since he's never worked them before. I started with measurements of everything and an evaluation of physical movement. Doug is 64 years old and never knew he had limited rotation of his left arm until I had him go through the motions (without weights) of two lifts using proper form. Sure enough, the left side has restricted movement. I'm not going to post pictures of Doug without his shirt but this image is very similar to what Doug looks like with his arm raised. I'm most concerned about that stringy tendon looking thing that connects his arm to his body. That part is exactly like what Doug has. In two weeks, using only two slow lifting exercises targeted for his shoulders and back with 10 and 15 pound weights, we've improved his posture, added 1 inch to his chest measurement and 3 inches to his shoulder/chest circumference measurement. Clearly, building muscle isn't going to be a problem despite his age but doing it slowly and without injury is going to be the challenge. Wow. I never knew. Doug's achievements are even more amazing in this light. This is an inspiring post - not only does it make Doug's achievements even more impressive, as Tillerman says, but it also clearly shows how lucky he is to have you in his life. Please keep us updated on progress. Yes, Doug is a unique collection of accomplishments and surprises. Some days I think he's lucky to have me but far more often I'm certain I'm luckier to have him. His sense of humor in the face of adversity is probably the best thing he has going.